Just wanted to share my picture with you and say THANKS! for all the information on your site. 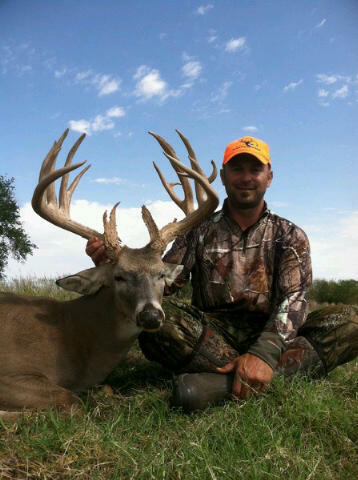 I shot this giant during the Kansas early muzzleloader season with my Savage ML II. It was a 260 yard shot! I read all your info on the website and shot all spring and summer to get ready for this trip. The Barnes Original and Orange MMP sabot did a great job pushed by 57gr of N120. Again Thank you for all the great info! © Copyright 2003-2011 by Randy Wakeman. All Rights Reserved.